A traditional gastronomic event – at its 13th edition – which takes place in the streets of the historic center of Salemi, in the province of Trapani, and which recalls every year thousands of visitors from all over Sicily . At the tasting stands it is possible to taste the special handmade pasta according to the culinary varieties offered by the chefs in the race, all accompanied by wines of local companies. 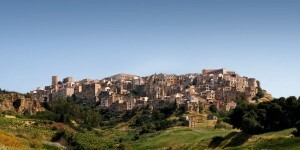 This a good opportunity for you to visit Trapani surroundings and try one of the best Sicilian pasta. The festival presents annually the rediscovery of a typical culinary dish of Trapani area, with the right wine to accompany to enhance the art of taste. The event takes place with the collaboration of local chefs and the participation of various folk groups. There will be a challenge among the chefs of local restaurants that will cook over 600 kilograms of pasta. During the event visitors can visit the monuments of the city, churches and museums of Sacred Art, Risorgimento, and the Civic Museum. The origin of the name Busiata is linked to busa, the knitting needle used by the housewives to make socks and sweaters. A textile tool converted to gastronomy that produces an original type of pasta, whose main feature is the callosity and permeability at the same time to the seasoned sauce, elements that make it unique and inimitable. The busa gives to the pasta the characteristic concave form that produces a double effect: to facilitate its cooking, keeping a pleasant consistency, and to be entirely wrapped up entirely by seasoning. Originally in Salemi the main dressing was the meat sauce or alternatively seafood.